With so much of the American economy foundering, it’s no secret that one bright spot is the American firearms industry. Gun owners’ fear of draconian legislation that may emanate from President Barack Obama, perennial top candidate for Gun Salesman of the Year, is unquestionably one factor driving this phenomenon. Sturm, Ruger & Company, Inc. (NYSE: RGR) is on pace to beat its own record of 1,114,700 firearms produced in one year, set in 2011. On August 15, 2012 Ruger produced its one millionth firearm of the year, a Ruger® SR1911™ pistol which will be hand-engraved by Baron Technology, Inc. and auctioned off to support the National Rifle Association Institute for Legislative Action. The firearms industry has seen consistent growth over the last few years, as measured by the National Instant Criminal Background Check System (“NICS”) background checks as adjusted by the National Shooting Sports Foundation. In July 2012, NICS checks rose by 25.5% compared to July 2011, the 26th consecutive month that NICS checks have risen on a year-over-year basis. Demand for Ruger products has outpaced the growth in overall industry demand, driven by new product introductions including the Ruger American Rifle™, SR22™ pistol, SR1911™ pistol, and 10/22 Takedown™ rifle. 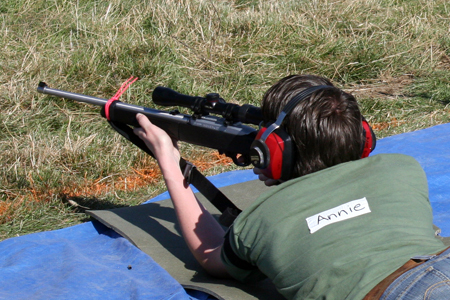 Annie Tuttle shoots the super-popular new Ruger 10/22 Takedown rifle at the Backwoods Home-sponsored Appleseed event. It’s a grand time to be an investor in the “Outdoor Equipment” space…. Both literally and figuratively. Even though I already own two 10/22s I want one of those 10/22 Takedowns! I don’t need it but I really, really want it! I guess that that sort of thinking is one of the reasons that Ruger, in particular, and the rest of the firearms industry is doing so well. Production up…how is the quality control holding up? Ruger didn’t build their 1,000,000th firearm of 2012. Somebody else made that happen. You managed to redeem yourself somewhat in my eyes with your Gun Salesman of the Year nomination, however! I did my part with a 10/22 takedown (love it! ), and a Mark III Hunter (accurate, beautiful, and pleasant to shoot!). I have plenty of other Rugers, but those are just the ones adding to Ruger’s 2011 fiscal bottom line. Quality American made guns will always be in demand, and Ruger is as innovative as they come. My takedown 10/22 is a fine example of American engineering, and until you snap one together, it’s hard to express just how much trust you can put into a click. I have been watching Ruger’s stock price since Obama was elected. It has increased over 500% since 2008. I wasn’t in the stock all of that time but I’m there now. Ruger has an excellent management team and the results show it. It looks like while firearms sales are increasing the “acceptance” of firearms is regressing….and that’s a good thing! Attitude towards firearms is becoming more like the 1930’s to 1950’s where they were a normal part of everyday life and owning several and (oh, the horror!) actually talking about them in public and using them for hunting, shooting, collecting and just plain fun. I’m really glad to see this. I always bring old gun magazines to my Dr’s, Dentist’s, etc. offices and leave them there for others to read. By my next visit (sometimes only a week later) they were always gone. I often wondered just how long they lasted and was it an interested patient that took some home or, more likely, the staff “weeding them out” of the other, more “acceptable” ones. Well, what a shock I had when returning to a Doctor’s office after 2 weeks. Not only was a gun magazine I had left still there, IT WAS IN A CLEAR COVER BINDER! Will wonders never cease? Anybody else notice more “acceptance” of gun stuff? At first the NCIS appeared to be nothing but a nuisance but maybe the statistics it produces about the importance of guns in our society for use by peaceful, law-abiding citizens is a bolster for gun owners. Rugers are good value for the money and its rewarding to see their success. Motor-T: You are absolutely correct. Ruger didn’t build those firearms. We, the citizens of the United States, we the buying public, we the supporters of the Second Amendment to our Constitution, we the supporters of free (unregulated) industry and American know-how, American manufactured and American designed freedom… WE built Ruger and support it as it grows. Without Us there is no U.S. of A. But Ruger sure helped themselves…. What also helps in stimulating firearms interest in the US are the cable shows American Guns, Sons of Guns, And all the gun shows on the outdoor channel. IN addition many people can follow a number of crisis heading our way- B. Obama’s second term, the UN arms treaty, possible economic collapse, the out of control and lawless government in Wash DC. I have at least 6 Rugers and love them all! Thanks for the update. Nice idea, Paul- but you’re wrong. To prove my point, try to buy a machine gun made after 1986 sometime…or cut your rifle’s barrel down below 16″ or your shotgun’s barrel below 18″ without a $200 tribute coupon. Either you are not aware of the restrictions mentioned above (hint: DON’T try any of those things! ), or you’re content to have those restrictions- but bottom line, you’re wrong. Gun-purchasing rights and freedoms are still substantially suppressed in certain ways throughout this country, and we’d all do well to a) remember that fact and b) work to change it for the better at every opportunity. As a resident of Prescott, AZ, I am very proud and appreciate the quality produced by Ruger. Dave asked about current quality control. We’ve had several new Rugers in class lately, mostly SR9 pistols, and they’ve worked fine. I shot the Takedown Ruger 10/22 Annie Tuttle is pictured with in the blog post, and it was excellent: good workmanship, shot tight, decent trigger. The last gun I bought was an LCR .22 revolver for my significant other, and the fit and function on that little Ruger was top notch. I am aware of the NFA. I agree with your point. I was just trying to strike a positive note. I’m NOT trying to start an argument, but the bottom line is: If I really wanted to buy a machine gun or a SBR (and could afford it) I could. Well, maybe if I didn’t live in Illinois! But that’s a whole ‘nother story! I am a ruger shareholder and i just bought my new ruger scout rifle with a the profit i took on selling off a few shares recently. Chuckled all way home. Love this rifle by the way! At the risk of sounding like a grammar nerd, I just wanted to thank you, Mas, for writing “foundering” rather than “floundering.” So few writers know the difference, especially on the internet (which can be a depressing place for an English major to dwell). A neighbor and good friend bought an SR1911 early this year (he did his part for the 1,000,000!) and I was very impressed with its workmanship. I would not hesitate to purchase one, especially given its price. What John Browning was to firearm design (function), Bill Ruger was to firearm manufacture. Mr. Ruger took design for manufacturing to a whole new level and if a manufacturing process did not exist, he made it exist. That allowed more traditional designs (not stamped sheet metal and injection molded plastic) guns to be made and to be made so the common man could afford them. It has to tough though, if Romney wins the demand goes down and the industry could nose-dive with lack of demand and a bunch of newly trained workers laid off. On the other hand, if the economy improves more people could buy recreational arms. Ruger has embraced cellular manufacturing, so it could transition from a different mix of, say, self defense and hunting hand guns a lot less painfully than factories of the past could. I’ve worn out springs in my Ruger .22’s, mag springs as well. But trust them? Absolutely! That’s how the springs got worn out in the first place! I didn’t care for Bill Ruger’s positions on modern sporting rifles, but he and the company he left behind are great American success stories. I also find it interesting that while manufacturing in general has just about left our shores, or is owned by the government, firearms companies are sizzling! Just don’t let our guards down; I live in IL, home of Armalite, Rock River, Lewis Machine Tool, Springfield and others; former home of Les Baer, who, tired of the worry of being made a felon by Chicago politicians, crossed the river. As a country, we have no river; we must continue the struggle! My first centerfire handgun (1963) was a Ruger .357 Blackhawk. I still have it and it’s functioning perfectly. My latest (but certainly not last) Ruger is an LCR in .38 Special just bought this month. The quality of workmanship hasn’t changed in 49 years. This gun is as good as the Blackhawk even though made of materials undreamed of back then. This is why Ruger is so sucessful. Bill Ruger demanded virtual perfection in production and, even though he’s gone, Ruger management continues with that tradition. We’ve done our share to help that million mark — and bought stock too! Love how the Rugers shoot. As to whether guns are more “socially acceptable”… I think that depends on where you live and the company you keep. We moved from Virginia to NC and I’ve seen a big improvement! Actually, Phil H, both “foundering” and “floundering” are appropriate words to describe our current economic situation. Bill Ruger had the intelligence to design his own firearms, along with the drive to learn how to get them produced for us to enjoy. Obviously hewould need the help of machines and people to operate them. But it all started with Bill. without him there would be no Ruger guns for us to use.